In the last 5 years, we’ve tested and reviewed over 120 air mattresses. What we have seen in this size is that Twin XL air mattresses are scarce. Let us just give you an idea of how limited the choices are – out of the 120 air beds we reviewed ONLY 2 come in Twin XL. In case you’re looking for this specific size don’t panic just yet, because there is good news. The 2 products in this size also belong to the top 5 highest-rated airbeds overall. In the analysis below, you’ll see the mattresses rated in 5 quality categories: Air retention, Comfort, Durability, User satisfaction & Value for money. What’s probably even more important, we’ll go into the differences between the 2 products to give you an idea about which one suits your needs better. This Fox is not only one of the Top 2 choices if you need an extra long air mattress, but it is also one of the toughest airbeds we know. What stands out the most is the vinyl used to make it. Here’s what we mean by that – the industry standard for vinyl thickness is 0.04 mm, while this Fox is 40% thicker – 0.06 mm. This means lower incidence of air leaks, low risk of your mattress getting punctured and a sleep experience that’s very close to that of a regular mattress. You can see all of its ratings below. The choice here is pretty simple because the second mattress (that we’ll talk about in a minute) is much firmer than this Fox. The bottom line is that Fox Plush will be the choice of two groups of people. One – those who prefer a loftier, medium-firmness sleep surface. Two – people who are not only tall but on the heavier side, too. 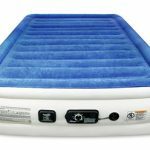 It’s the thickness of the vinyl that allows this air mattress to take on more weight without developing a leak or bursting a chamber. & compare current prices by following the links below. Before we move on, let’s clarify that “Best Choice” is the actual name of the product. It belongs to the group of new arrivals to the market that have stirred the waters in the past few years. Before 2013, the industry was pretty much dormant, with the same products dominating and no significant change in either technology or materials. That all changed with the arrival of this air mattress and a few other models from younger companies. With Fox (above) the approach to making the airbed stronger is to simply use thicker material. That’s not the case here – the vinyl is improved without making it thicker. First of all – typically, your average airbed will be made of recycled vinyl. This is the ONLY ONE we’re certain is made of virgin vinyl. You probably get the difference – “Virgin vinyl” means that it’s the first time the material is used. This is important because vinyl uses some of its properties in the recycling process. Secondly – the body is not plain PVC; the vinyl is layered with a nylon laminate to stabilize it, make it more scratch and puncture-resistant and lower the incidence of defects, like splitting of the seams and pinholes. This basically means that it is likely to be a choice of those who have plans of using an airbed frequently or even sleeping on it long-term. It’s also one of our top picks for the most durable air mattresses and in the categories of inflatbles that can be considered cat-proof. Who is best suited for? This mattress will be the choice of people who prefer a firmer sleeping surface. Another plus is the included hypoallergenic bamboo topper. Based on our statistics, about 30% of new air mattress owners will end up getting an extra topper to make their airbed more comfortable. With this one, there’s no need for that, because the one included is just as good and you don’t have to spend extra money. Finally, if appearance is a factor, you’ll love the fact that the skirt attached to the topper covers all the plastic parts. The terms of the warranty are as flexible as you can see in the industry – 1 year of warranty on the defects and, more importantly, a 60-day return warranty. It’s the latter that makes all the difference – it basically means that if you don’t like the mattress for any reason at all, you can send it back within 2 months with no questions asked. Hundreds of new owners shared their experiences and answered questions about this mattress on Amazon. You can see all of them by clicking on one of the two buttons below. In the section below we’ll go into more depth about the two extra long Twin airbeds and analyze the features that earned them a place on this list. We’ll also address some of the FAQs. What good is pooling all that data over the years if we don’t use it to reach relevant conclusions based on the numbers, so let’s do that here. Over the years of reviewing and testing airbed, we noticed a few patterns. One of them is that beds that are sturdier and more durable are usually not as comfortable. That’s not surprising since we know what it takes to make a tough airbed. It involves strengthening the core, reinforcing the beams and chambers so there’s less swaying (lateral movement) and sinking (stability of the top surface). If you leave it at that, you will have one tough blow-up mattress, but you’ll “sacrifice” some of the comfort in the process. The fact that this Fox belongs to the top 5 inflatables in both comfort and durability speaks volumes. An airbed usually has a wobbly, unstable feel to it and we’ve yet to meet an adult person that likes it. That’s why 1 in 3 people will get an extra topper to compensate for that bouncy feeling. Fox resolve that issue here by separating the two structures (the inner chambers and the top sleeping surface). They did that by adding an extra layer of air chambers and the top. The air inside an inflated mattress is a closed environment. The science of temperature distribution in any closed environments says that particles will move up and down until the energy (temperature) is evenly distributed. To put it less “sciency” – the air inside will move until the temperature of the molecules find a balance. Typically, a one night of sleep won’t be long enough for that to happen. That’s why you might feel surges of hot or cold air through the night – it happens when a cluster of cold or warm air molecules hits the top surface. In the case of this Fox those swirls of hot/cold air will not directly hit the surface underneath the sleeper, but the air-flow layer. What this means is real life is that there’s a barrier between the temperature volatility of the air and the sleeper. It’s this unique design that allowed Fox to find its place on the list of top-rated inflatables both in durability and comfort. An air bed based on coils for the inner structure will outperform chamber-only design in 70% of the cases. To make sure that this number is relevant, about 6 months ago, we did a mini-study of our own. We compared inflatables of the two types (coils vs. no-coils) in the same price range. The results were pretty conclusive and coils outperformed about 70% of the time. It doesn’t come as a surprise because the very reason air-coils were introduced is to mimic the effects of steel springs in regular mattresses. Most air beds on the market today rely on the coil technology and what separates the winners are two things – what kind of a “backbone” the coils have and how many of them structure includes. There are 24 coils in the Fox Plush extra long air mattress, which is one of the highest numbers in the industry (that includes all inflatables in Twin size, not just the extra long). This makes it a good option for camping because access to a power outlet is not a must. The air release valve is labeled as “deluxe” by the company and speeds up the deflation. It can only be compared to the Whoosh valve of Aerobed air mattresses, which is the measuring stick in terms of deflation efficiency. What’s the difference a Twin and a Twin XL air mattress? A Twin XL has the same with as a regular Twin but the length of the Queen, which is usually 80 inches. You can see our full guide on twin air mattresses here. What we especially like about the Fox brand is that their products are true to size. It might sound like a given, but trust us, it’s not. The issue of the bed not being true to size usually comes in two forms – the more common one is the product being blatantly smaller than the listed dimensions. Inflatable beds usually have arched sides, and some of the brands list the dimensions of the further-most points. That’s misleading because, depending on how “bulged” the sides are, the difference between the dimensions can range anywhere from 1 or 2 up to 5 inches. That’s why we’re making a special point to stress Fox being true to size – the listed dimensions are the actual inches you get for the sleep surface. Can it be used on a platform/frame? If you do try to experiment with it, we would advise using protection of some sorts that would be smooth enough not to cause any pinholes. A classic bed frame will have wooden slates and no matter how smooth they appear, there will always have tiny prickles that can damage your inflatable. This Fox comes with an alternative pinch-hole valve that can be used with a manual or leg pump, but most campers will find it too time-consuming to regularly inflate on the campsite. The alternative here is getting a converter/inverter that will transform the 12 V current of the car outlet into 110 V that you need for the pump. If you do that, make sure to factor in the power to avoid overheating and damaging the circuitry of the pump motor. Is a remote control included? Fox makes a wide range of airbeds and many of them are similar in appearance to this bed. Over the past 6 months, the number of questions about this bed including remote control increased, probably because of the new arrivals from the company. To be clear, the Fox Plush Durabeam does not include a remote control or a corded wand, the pump is built-in and you operate it by manually choosing the settings. It takes about 3 minutes to inflate this Twin XL and about 4 for other sizes it comes in (Full, Queen and King). It’s common sense that the thicker material makes this Fox heavier and bulkier compared to models from competing brands. This is not a big issue for home-use but it is relevant if you plan to take it camping since it’s only an option if you have the room in your trunk. The indentations in the sides of the bed are deep enough to form a good grip with fitted sheets. The depth of the sheets will depend on which of the three side “rims” you want the elastic band to grip. You will see minimal slippage with deep-pocketed sheets and you can even get the extra deep type which will allow you cover the whole side surface of the mattress. We would advise going with the deep-pocketed. Ideally, we’d go with 23-25 “. Last but not least, standard Twin sheets will not be a good fit since this is an Extra-Long. They will be wide enough, but too short. To both inflate and deflate use the round “knob” on the side of the mattress and turn it clockwise for inflation and counter-clockwise for deflation. It can also be deflated by simply opening the valve and squeezing the air out by applying pressure, but we don’t see any reason for that unless the pump somehow malfunctions. You’ll notice by this point that the versatility of options is a big plus for this Fox and an important part of that is the construction of the pump and valve. Once of the bed reaches your pre-set firmness, the pump automatically shuts off, which means that you don’t have to ”tend” to the bed when setting it up. Is there a dual control system? You typically see dual controls in high-end inflatables of queen-size and up. There are no dual controls here. For readers who don’t know what the feature means, let’s take a moment to explain. Dual control airbed will allow you to inflate the halves to different levels of firmness. No, the pump is corded and attached on both tends – to the pump on one and the plug-in on the other. However, it doesn’t get in the way because there’s a dedicated space on the side of the bed to pack it in while not in use. The first thing we would like to stress about this extra long air bed is that it comes from a well-trusted company. That might sound counter-intuitive since we already said that it’s a young product, so let’s explain. The people behind this bed are industry veterans who run the site airmattress.com…it’s been around for decades. Their business used to be limited to carrying and selling other brands, but the rumors about the company making the product of their own were whispered for years before this bed hit the market. The company brought this mattress to the market in 2015. We tend to be cautious with new arrivals before they reach a certain number of user reviews. We also typically weight at least a year before including a bed in our guides, but we did make an exception for this one. Within 8 months, it was listed as one of our top picks in a wide range of categories, including the list of best air mattresses overall which you can seee here. The first one is that the mattress quickly became one of the most popular products in the market, which gave us enough data for the statistical analysis. Even if that weren’t the case, we would have no trust issues because of the reputation of the company behind it. The formula we use for the ratings was tweaked over the years. One of those tweaks was the inclusion of the TF adjustment. TF stands for Trust Factor – its number in the range between 0 and 1. To assign a TF to a company, we do an in-depth analysis of both our experiences with the brand and that of users. This includes all the products from a specific brand. TF reflects things like the responsiveness of their customer service, the accuracy of their advertising claims and the reliability of the warranty policy. Long story short – TF is crafted to reflect what kind of experience you can expect in dealing with a brand if things go south, like receiving a flawed product or claiming a warranty. In this case, the company has a maximum TF of 1. Browsing through the market can be confusing (and that’s an understatement if there ever was one). How is a new customer supposed to differentiate between high-quality products and “losers” if the wording in their advertising claims is practically the same? Whichever airbed and you look at, the claims will typically include wording like “durable”, “puncture-resistant”, “heavy-duty” and similar vague statements. That’s why the arrival of this product was refreshing since the claims made were measurable and specific. It quickly became one of our “favorites” in a few important categories. As we said above, we like to see specific and accurate claims in the advertising of the product and that’s exactly the case here. Let’s take the material as an example of that. Instead of vaguely describing why the PVC used might be better, they specifically explain the manufacturing process. With classic PVC, to get a more durable surface that’s harder to puncture you simply have to go with the lower gauge (higher thickness). The lower the gauge, the bulkier and heavier an air bed will be. But if you get creative you can improve its properties without adding the extra weight. Vinyl is by far the most commonly used material for inflatables, primarily because it’s so malleable and easy to work with. The downside of that is being prone to scratches and punctures. That’s why the protective layer of nylon encasing used here is so important. First of all, it makes the material more resistant to scratches and punctures. Just as important, it increases the cohesion and stabilizes the structure. This, in turn, results in less force expended on the chambers and the connections. To put it simply – the airbed is less likely to develop a leak in the most common areas, like around the pump or at the seams. The secondary benefit of strengthening the PVC by applying a layer of nylon laminate is that it results in a lighter material. The classic finish of most air beds is a soft material that resembles velvet or felt. This type of flocking is a magnet for lint and pet hair. A commonplace cleaning solution for most inflatables will be vacuuming the top surface with a brush attachment and then using a damp cloth to finish the job. The topper that comes with this extra long air mattress is based on bamboo fibers, completely detachable and can be machine-washed. If you are washing it in a machine, choose a gentle, cold to low-heat cycle to avoid the topper losing shape. In the long run that makes it much easier to clean and maintain. Is it portable and how small does it pack? The secondary valve can be used with alternative pumps and its main purpose is to offer the option of camping out. That would be much less of an advantage if the bed didn’t pack as small and light as it does. According to our measurements, the folded size of the bed and topper is approximately 17.7 x 15.2 inches. If you’re camping in colder climates you might need some extra insulation. The advice we’d have here is to use a canvas fabric between the floor/ground & the mattress to eliminate some of the cold emanating from the bottom surface. Since the material is not your typical PVC and responds well to temperature changes it’s also an option to use a heated pad without compromising the structural stability, which would be the case if the material was vinyl-only. This is only our opinion and it’s common sense that you should be cautious when using any electric add-ons like toppers and pads and not leave them unattended for a prolonged period. If you’re camping in a warmer climate and have access to power, you can use a cooling mattress pad or topper to control the temperature of the sleep environment. Do bear in mind that this bed is still made of synthetics and take precautions to closely follow the instructions of the cooling add-on. It’s just as important to choose a reliable cooling pad – you can see our guide on best cooling mattress pads and toppers here. When we compared this bed with the stats we have on the models made from common vinyl we saw a significant difference in the % of users mentioning odor as an issue. We think that the reason behind it is that rubbery smells that you typically see come from the vinyl off-gassing. Since the PVC used here is a virgin and encased in nylon, the incidence and percentages of off-gassing are practically non-existent. We measured the box (the one it arrives in), and it measures approximately 17 x 13 x 9 inches. The size of the drawstring carry bag is slightly smaller than the above-listed dimensions of the box. Is it prone to bedbugs? Vinyl is not an attractive material for a bed bug, so we would limit this question to the topper and the skirt. The bamboo fibers and topper are naturally hypoallergenic and don’t attract bedbugs or germs. This monhts’ update brings no significiant changes or new arrivals. We rarely see it in this category in general because, as we stressed, the demand is limited and most of the top companies don’t make a model for the extra tall. The above analysis of the two air beds that come in the extra long Twin size should give you an idea of what to look for. The questions to ask if you’re buying in-store should primarily be about the material and the bed being true to size. The former is pretty self-explanatory – ask about the type of vinyl used, its thickness and whether it’s recycled or virgin. The latter question (regarding the mattress being true to size) is about being precise about the dimensions listed in the fact sheet. It comes down to making sure that you are indeed getting an extra long air bed and the listed size is the actual sleeping surface and not to the further-most points of the inflated bed. The ratings you saw above are updated on quarterly basis to make sure that we only present relevant and fresh information. If there is something that we haven’t covered in this guide, feel free to reach out in the comments below or by directly emailing us. There are 6 of us on the team and responding to reader correspondence is a priority, which means you can expect to hear back within 1 day. What is the weight limit for you twin xl air mattress ?? Hi Betty, typically it’s 300 lbs. If weight capacity is one of your concerns, I’d go with this one. It’s not only our top pick here but also featured in our guide on “most durable” here. What are the actual dimensions of the XL-Twin air mattress with pump? Hi Michael, there are slight differences between brands but, in most cases it’s 300 lbs. Is the Best Choice twin XL true to size like the Fox twin XL? Hi Dana, yes, it is true to size based on what we saw. The one important thing here is that those two beds are somewhat sturdier (Fox because of the material thickness and BC because of the layered vinyl) which eliminates a common issue of sinking. In other words, when people say that a twin is not true to size, it’s often because it looses a bit of the firmness and sinks towards the middle. If you measured it in this scenario, you’d think that it’s smaller than the actual size. In most cases, the problem goes away as the vinyl sets in and stretches into its true size. But again, the two models you mentioned are much less affected by the issue.